I love the leading lines of a railroad track shot, but this one has even more with the bend in the tracks. I think making this B&W adds even more. What an interesting image. Well done. I wonder...if you were not shooting for the challenge, your main point of focus could have been further in to the image. I love the contrast between a water tower and cactus. Beautiful black and white picture. did you use a polarizign filter on this picture? Very nice B and W. I like the tonal range here, good DOF. This is such a great image. All of your pictures are wonderful, it is nice to have people like you to look to for inspiration. Wow! This is an amazing image. I love the contrast, the detail... everything. Great pic here! 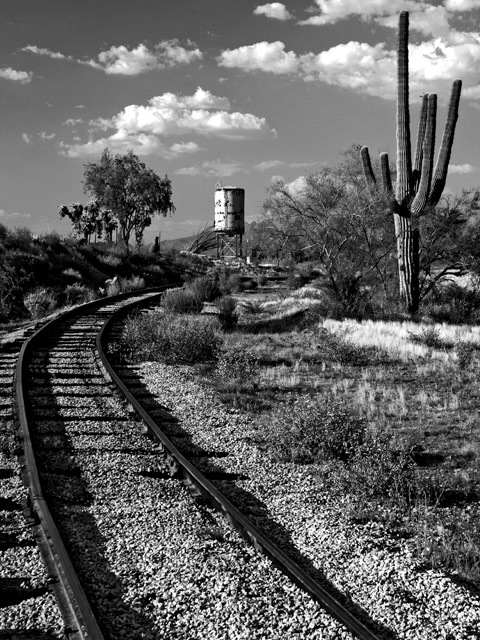 First, on the technical aspects of this photo: the use of the railroad tracks as leading lines in to the desert landscape, right to the water tower, is perfect. The inclusion of the giant saguaro cactus really adds to the impact of this shot. And the mono conversion was done very well. Now, on another note: I really love Arizona landscapes. I grew up down there, and seeing things like this really makes me miss the area. This is a very nice photo. I like this shot. It's got a very "Ansel Adams" feel to it. Nice depth of tones - all the way from black to white. The composition is great too. Perfect for the challenge. The tracks lead your eye right in. Good DOF - sharp right from the front all the way to infinity. A cool b/w with rich shadows. Lovely. Bumping up. This like an old photo from the Wild West. You've captured a mood too, hope I'm not the only one that feels this also. Great detail, composition and clarity. The lines really lead the eye into the frame, towards the tower. Great contrast on this. It makes the picture really pretty. I love the black and white. The comp is great the focus seems a little soft. YEAH! Leading lines I can see and that actually lead to something too! Beautiful image, very effective B & W...nicely seen. Like the angle on this image, but tired of seeing train tracks. Still a good shot though. Very nice composition. Good contrast. Proudly hosted by Sargasso Networks. Current Server Time: 04/20/2019 08:41:55 PM EDT.